Jose Bautista watches his seventh-inning RBI single against the Nationals. Don't start planning the World Series parade just yet, but perhaps hold off on the eulogy. The Phillies showed Wednesday night that they aren't done yet as they pushed back against the Nationals with a series-salvaging win. The Phillies used eight pitchers, Carlos Santana hit a grand slam, and Jose Bautista made his presence felt. And the Phillies picked up a game on the Braves, who lead the division by 3 1/2 games. The Phillies are off Thursday and the Braves play the Cubs, who will come to Citizens Bank Park this weekend for three games. It should be an interesting weekend. "We're trying to win every game. That doesn't mean we're going to," righthander Jake Arrieta said. "To count us out already just because this team has lost 100 games the past several years, like, that's ridiculous. We have plenty of time." Phillies Jose Bautista (right) and Carlos Santana celebrate after scoring on Jake Arrieta’s two-run single. 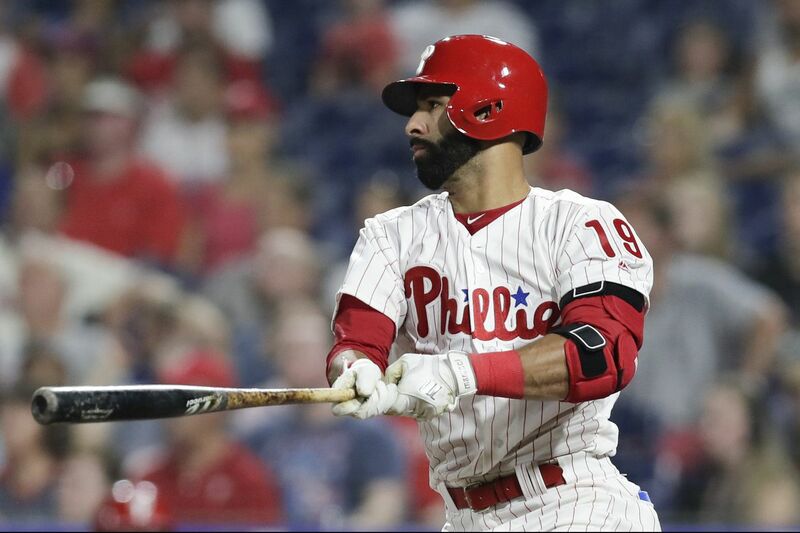 Jose Bautista arrived in South Philadelphia just before first pitch Tuesday night, so he was at Citizens Bank Park just in time to see perhaps the worst Phillies loss of the season. And he stuck around Wednesday to see how the Phillies have seemingly responded all season to challenging nights: They bounced back. Bautista, in his first start since being acquired from the Mets, singled in the go-ahead run with two outs in the seventh inning of an 8-6 win over the Nationals. He reached base in each of his four plate appearances, working a pair of walks and getting hit by a pitch. "One of the things that we knew about him is that he plays Phillies-style offense," manager Gabe Kapler said. "Grinds walks, deep counts, find his way on base, absolute calming presence. Very similar to what [Wilson] Ramos has brought and kind of what [Aaron] Nola brings out on the mound. It's a quiet, smooth confidence that kind of resonates in the dugout, wears off on everybody around him. Really smart guy following the game. That's a tremendous performance today." Kapler informed Bautista on Tuesday that he would start Wednesday against lefthander Gio Gonzalez. It was Bautista's success against lefthanders — Bautista has a .380 on-base percentage this season against lefties and a .904 OPS against lefty starters — that attracted the Phillies. Bautista will turn 38 in October and might no longer be the "Joey Bats" who twice led the American League in homers. But he proved Wednesday that he could be of use to the Phillies. Kapler can start him against lefthanded pitching or save him as a weapon off the bench when the opposition inserts a late-inning lefthander. Bautista, with the approach he showed Wednesday, will have a role with the Phillies. "I'm not scared. I played enough games, and I'll place a bet on myself if I need to," Bautista said. "That's just my attitude. It's not necessarily a reflection that I think I'm better than anyone else. As a competitor, you have to have that mindset. Again, you're going to do well sometimes and sometimes you're not. You just keep grinding until you're successful. Especially in baseball, you have to have that attitude. If not, you're going to get worn down mentally." "Bullpen by Gabe," which was trademarked in May by our Scott Lauber, made a return Wednesday night as the Phillies used seven relievers to complete a big win over the Nats. It felt as if Kapler was managing a must-win game after another tough loss. But Tommy Hunter, who worked the last two innings, put it best: "I think he's been managing like this since April." Carlos Santana's grand slam Wednesday night was his "biggest hit as a Phillie," Bob Brookover writes. Santana has been the target of dismay from fans this season, but nights such as Wednesday could turn that around. "The fans don't know me, but I can finish strong," Santana said. The Phillies shuffled their starting rotation to have Aaron Nola start Sunday against the Cubs instead of Monday in Miami. Nola will start at least two and possibly three additional games at home, where he's been excellent this season. Asked why he did it, Kapler cracked, "Mostly because Nola is awesome." Jose Bautista began his season with Atlanta but played just 12 games before he was released. His time with the Braves gives him a unique perspective into the race for the division crown. He sees the Braves "as beatable" and likes where he's sitting with the Phillies. Today: Several Phillies will spend the off-day Morgan's Piers for an event with the SPCA, 6 p.m. Tomorrow: The Phillies open a three-game series vs. the Cubs, 7:05 p.m.
Saturday: Zach Eflin starts against the Cubs, 7:05 p.m.
Sunday: Aaron Nola starts "mostly because Nola is awesome," 1:35 p.m.
Phillies pitcher Tommy Hunter points into the Phillies dugout after finishing the eighth inning. Tommy Hunter's two-inning save Wednesday night was the 11th time this season that a Phillies pitcher recorded a save that required more than three outs. Hunter joined Victor Arano, Seranthony Dominguez, Jake Thompson and Hector Neris in that club. It's the most saves the Phillies have recorded that required more than three outs since those unforgettable 1996 Phils had 15 such saves. Those pitchers: Ken Ryan and All-Star Ricky Bottalico. Question: After watching the latest debacle on Tuesday night (and from a fan who has to work hard to follow the coverage remotely in Boston where everything is overloaded with Red Sox and Patriots), I simply cannot take Kapler's outward reaction to these comedy of errors. Simply put, good teams catch the ball and execute pitches. They don't throw it around the yard and implode late in games. Say all you want about how it's a little flukey and not always the same guy making a mistake, but a little fire from the manager at this point is really needed. I don't want to hear about taking a gut punch and getting back up. It's not a gut punch when you constantly take a beat down while lying on the mat. 5 games in the loss column and now being out of the wildcard with the hot teams in the central and west is becoming a real issue. — Joel F. via email. Answer: Thanks, Joel. The Phillies seem to be testing how many gut punches they can take before the ref waves this one off. The defense has been problematic, and some of the errors have been inexcusable. Kapler was asked before Tuesday's game how he stays so positive instead of allowing his temper to flare even when things seem to be trending in the wrong direction. So I'll let him answer your point about his outward reaction. "Let's have the discussion," Kapler said. "Do you think that yelling or screaming makes a man more or less engaged? More or less likely to make an improvement, just in your experience? "So Joe Maddon, Terry Francona – one of the game's best managers. Clint Hurdle had quite a bit of success at times. Johnny Oates, I thought, was a really good manager. Jerry Narron, who has been around the game as long as anybody," Kapler said, listing the managers he played for. "I'm not sure I remember any of them so much as raising their voice. None of them. "I played for Clint Hurdle for a full season from 2002 in the middle of the season until 2003 in the middle of the season. I can't remember a moment where he lost his temper and ripped the paint off the walls or flipped the spread table or pulled the base out and threw it somewhere, slammed his hat down and threw dirt on the plate. It may have happened. It didn't have an impact on me if it did."